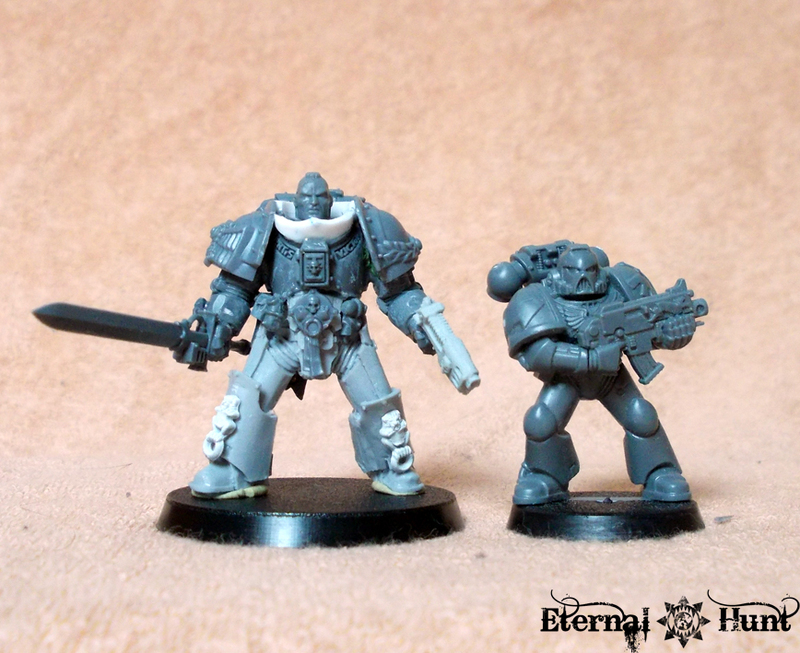 Almost every INQ28 aficionado will invariably start thinking about true scale Astartes at some point in their hobby life. 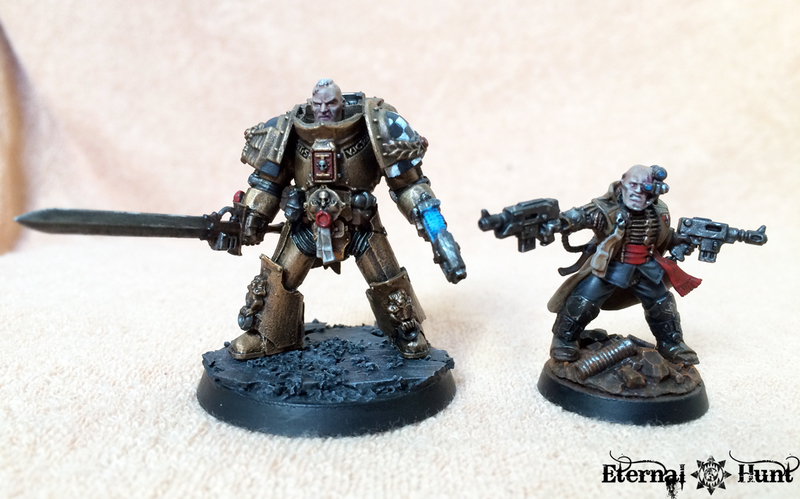 Maybe it’s a strange relapse to the stage of desperately wanting to incorporate Space Marines into games of Inquisitor, maybe it’s the realisation that INQ28, with its bigger focus on individuals over squads or armies, is the perfect occasion to do justice to the legendary transhuman warriors the Astartes appear as in the background. Whatever the reason, many hobbyists feel drawn to the task of building their own true scaled Marine — or ten, for that matter. So much for the conversion job, then. 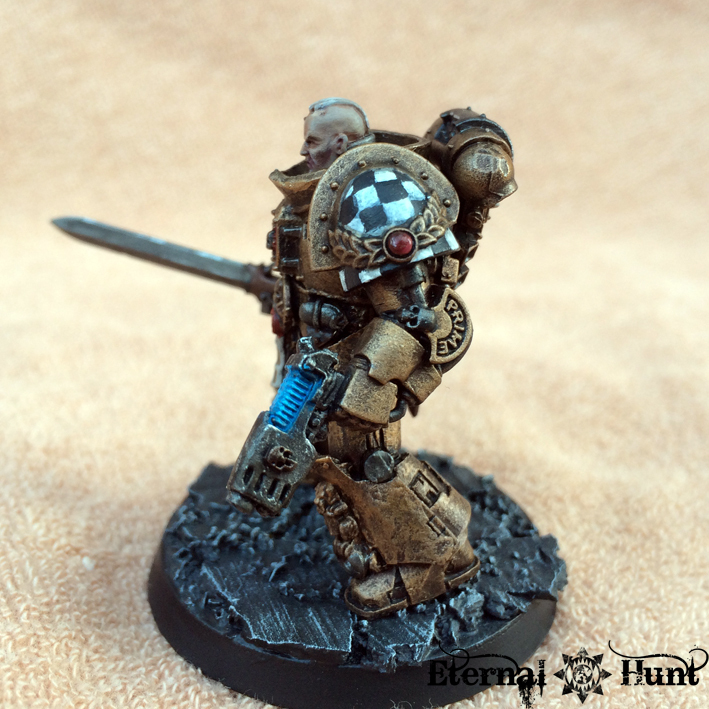 But it was obvious that the model would have to be painted at some point, and I really wanted to give it my best shot. 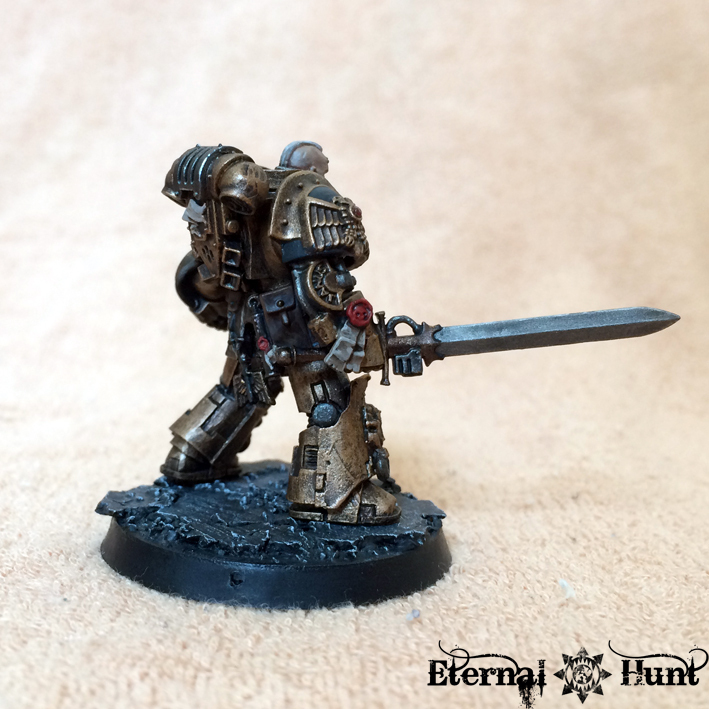 I did have an idea for a highly ostentatious, “blinged out” Imperial Fists successor chapter that patterned itself after the Legio Custodes of old, to some degree. But before I jumped in at the deep end, I set out to collect some inspiration to help me. Thanks must go to DexterKong, above all else, as some lengthy conversations with him helped me nail down what I wanted the Golden Legion to be like. So why some of the chapter history may still be up in the air at the moment, the ideas born in these conversations really helped me to imbue the model with an underlying narrative, even if you know nothing about the actual chapter. Regarding actual models that inspired me, Bruticus’ wonderful Brother Mythras of the Sun Titans was certainly a huge influence, seeing how he’s both a Marine in golden armour, plus Bruticus also used the Custodes connection in his fluff — speaking of which, definitely make sure to check out the chapter’s excellent background! Then there were EdT’s amazing true scale warbands (I recommend you bookmark his thread right away), which were also a huge help in getting me started. 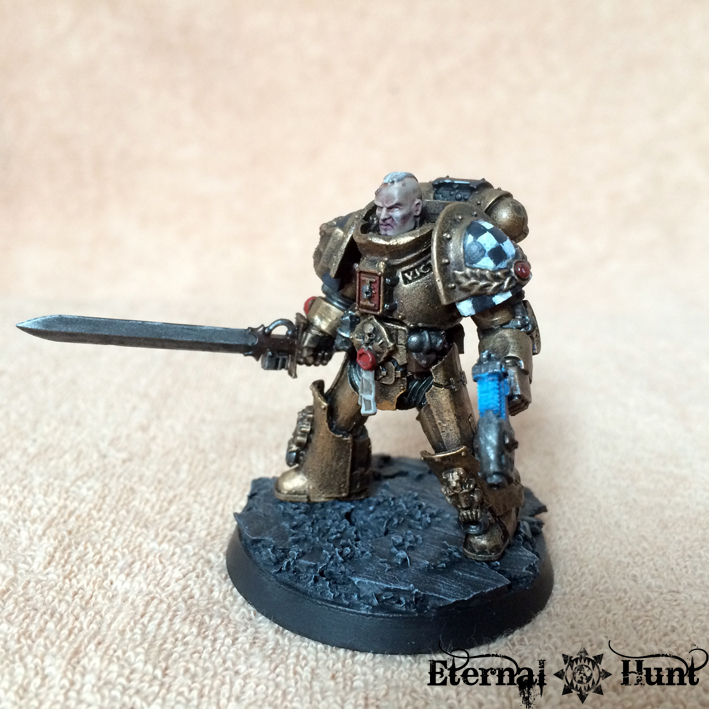 …which then went right back into influencing the paintjob for my own model (as you will see in a minute). 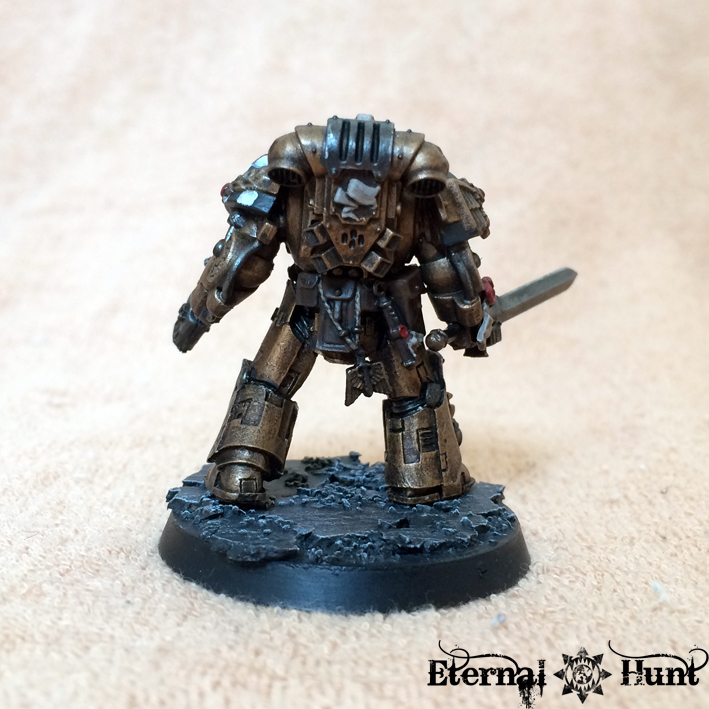 The recipe was easy but effective: The entire model was undercoated with black spraypaint (as usual), then generously drybrushed with GW Warplock Bronze. Then a wash of Gryphonne Sepia (although Seraphim Sepia or Army Painter Soft Tone would probably have worked just as well), then another drybrush with GW Brass Scorpion. 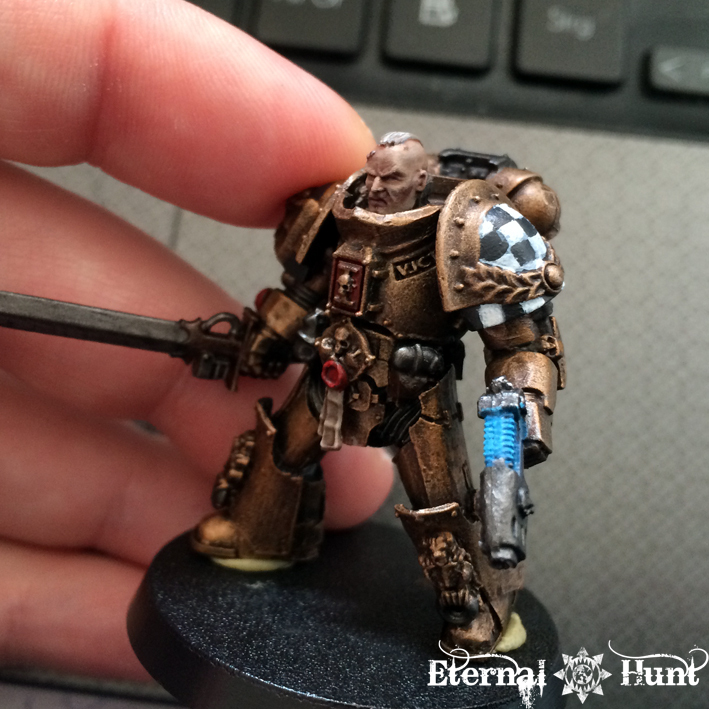 And finally, some more controlled highlights with a mix of Brass Scorpion and Mithril Silver. Not rocket science, really, but it got the job done. Some people have remarked that he seems like a gnarly, hard-boiled Clint Eastwood type to them, which is exactly what I had in mind: The backstory for Brother Auriga is that he is no longer 100% combat worthy after an injury and has been seconded to the council advising the Sector Governor by the Chapter’s Lord Commander, in order to speak as his representative. Brother Auriga is blunt to a fault, and was deliberately selected by the Lord Commander to counteract the amount of bargaining and politicking on the council. He also sees his posting as a honourless and onerous task and would much rather return to combat. 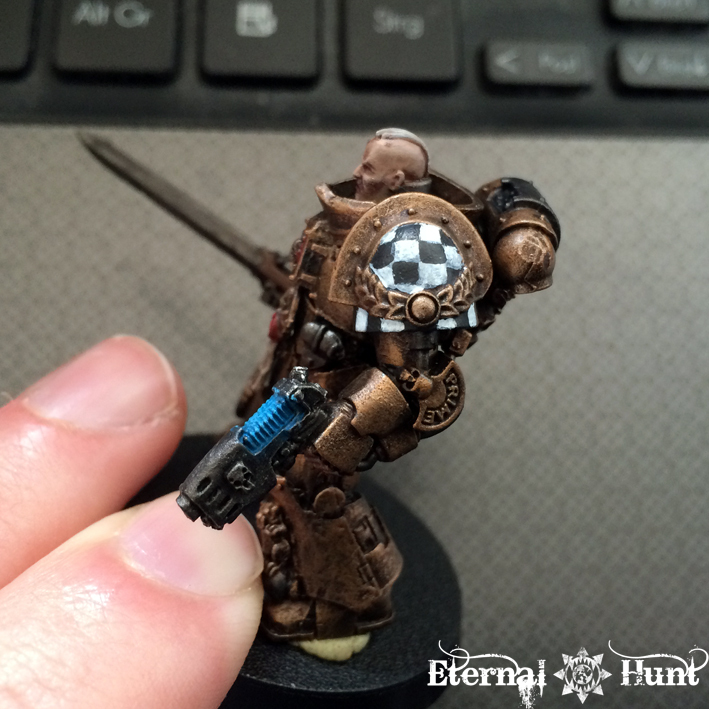 Oh, and one more thing about the model: You may have noticed that I’ve decided to keep the Inquisitorial seal on his breastplate. 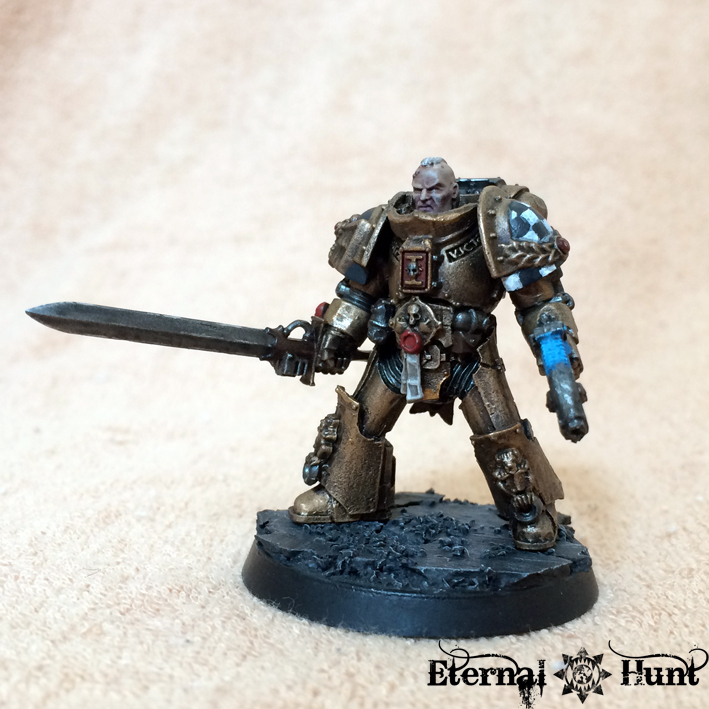 This wasn’t an oversight, but a conscious decision: Brother Auriga was one of a number of battle brothers who had the honour of fighting alongside the forces of the Ordo Malleus during the quelling of the daemon-infested world of St. Berthold, which is why he still proudly wears an Inquisitorial signet as part of his personal heraldry. Seneschal Secundus Goswinus Baehrn stood at the edge of the landing platform, his robes flapping about him in the icy breeze. Baehrn prided himself on being a thoroughly unemotional person, but even so, he had been extremely nervous, ever since the news had reached him half an hour earlier: The Astartes gunship “Falco Aureus” had made planetfall and was approaching the Hive Primus with an urgent dispatch for the Lord Governor himself. 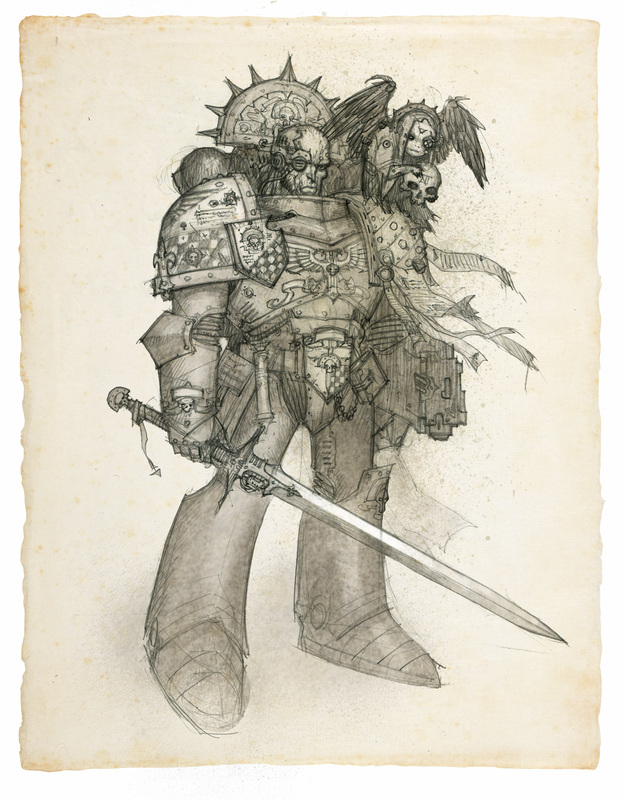 Direct dealings with the Chapter were few and far between these days, and mostly limited to the most prestigious social functions, which was why Goswinus Baehrn had never actually laid eyes on a member of the Adeptus Astartes up close during his fifteen years in his fairly prestigious position. Under normal circumstances, the task of welcoming a representative of the Legion on Bastold would have fallen under the purview of Senschal Primus Mathewelin, but the old man had retired to his chambers the prior night, with a generous supply of amasec and Obscura and, it was whispered, in the company of several women of questionable renown. In any case, Baehrn had been unable to rouse his superior, which now left him the highest-ranking official to deal with this unforeseen event — He could only suspect that the Seneschal Primus would have to say something about this breach of etiquette at some point in the near future. In fact, there would almost certainly be hell to pay later in the day, not a doubt about it, yet even this prospect was nothing against the mounting sense of dread filling Baehrn as he saw the Astartes vessel approaching: The gunship came in low against the rising sun, as if for a covert attack run. It was a blunt, brutal shape, not unlike a fist, the roar of its engines growing from clearly audible to almost unbearable, as it drew close to the landing platform. The gunship touched down at the very centre of the platform. Baehrn could see its golden bulk, the exquisite scrollwork and lettering in High Gothic proclaiming its many glorious years of service, yet also the scars and welts that spoke of a life of constant battles. 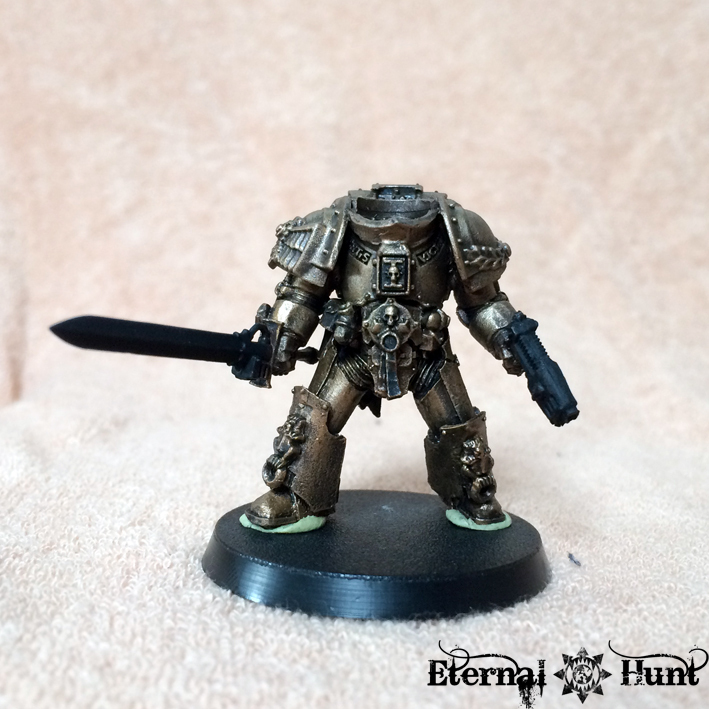 The Seneschal Secundus drew himself up to his full height as the front ramp opened with a hiss, taking a deep breath and sending a silent prayer to the God-Emperor to grant him composure. 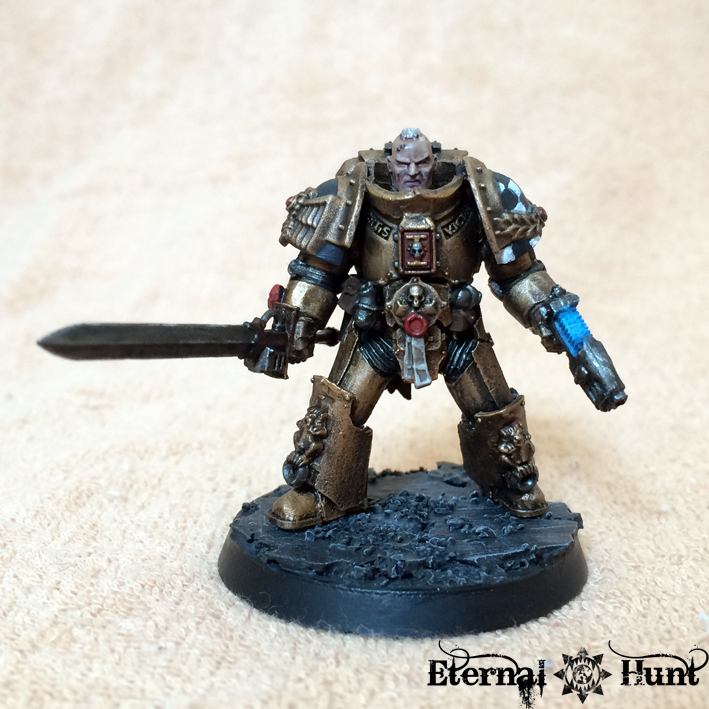 “They have sent us a statue!” That was his first thought as he saw the massive golden figure standing at the top of the ramp: A perfect rendition of an Astartes in gold, its armour beautifully detailed, its arms clutching a boltgun across the chest in the most iconic pose imaginable. Baehrn almost laughed out loud as relief flooded through him — the Golden Legion merely wanted to provide an overwrought – and fairly narcissistic – gift to the rulers of Velsen, doubtlessly to be unveiled during a suitably extensive and garish ceremony. This feeling was short lived, however, and quickly replaced by utter dread as the golden figure started marching down the landing ramp in precise, measured steps. “Who are you?” The armour’s speaker systems lent the voice a slightly metallic quality, but it was powerful and deep underneath. A voice that demanded instant obeissance. 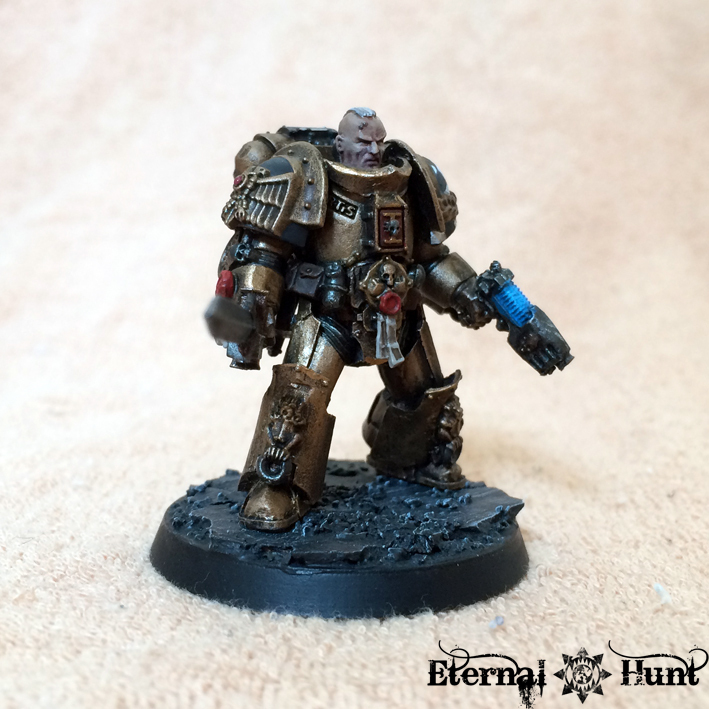 Baehrn could barely keep his emotions in check, reeling as he was from the implications of the Praetor’s words: The Golden Legion’s seat on the council had been vacant for a very long time – so long as to make the office seem more than a symbolic gesture than anything – and he doubted even the older members of the noble houses could remember when a member of the Chapter had actually traveled to Bastold to speak on behalf of his Lord Commander on the council. The mere revelation of this latest development would throw the council in an uproar. All of this went through Baehrn’s head, as his mind raced to find an appropriate reply. A non-committal “…my lord” was all he could safely come up with. “I will need accommodations for myself and my retainers.” The Praetor indicated a small group of robed figures exiting the gunship. With these words, the giant in golden armour started to march towards the Hive’s interior, with a very agitated Senschal Secundus doing his best to keep up. Things on Bastold were about to change. 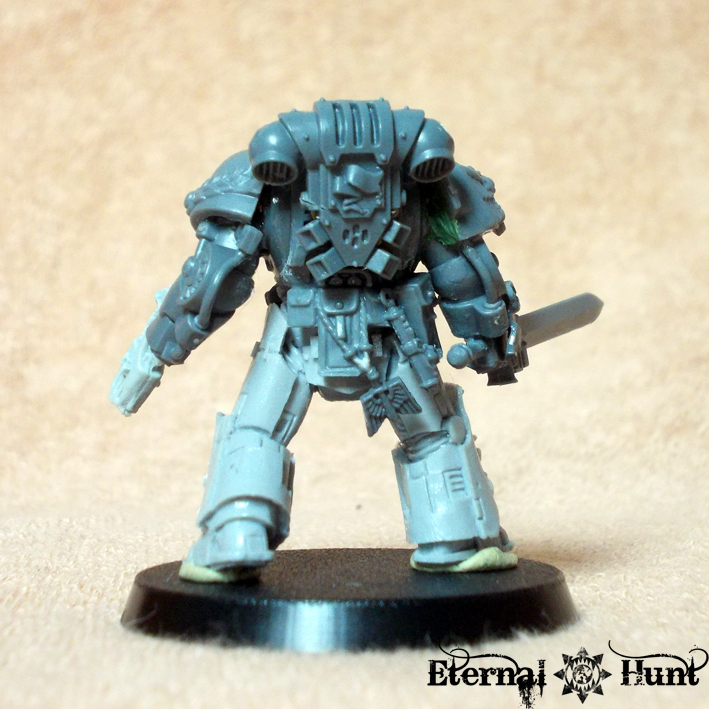 This entry was posted on May 1, 2015 at 15:15 and is filed under 40k, Conversions, Fluff, Inq28, Inquisitor, paintjob with tags 40k, adeptus astartes, art scale, background, bruticus, conversion, dexterkong, fluff, golden legion, INQ28, inquisitor, janus auriga, jeff vader, kitbash, paintjob, space marine, true scale, truescale. You can follow any responses to this entry through the RSS 2.0 feed. You can leave a response, or trackback from your own site. Very impressive! implementing true scale in INQ28 is a great way to go, and the background story is awesome, really makes him come alive. Even though you make the gold armor sound simple, it looks fantastic! Wonderfull mini mate… and what a chance to inspired Jeff ! GG to both! Cheers, mate! It’s important to point out that the inspiration went both ways, though: I am so glad Jeff’s illustration gave me the idea of incorporating that checkerboard pattern! 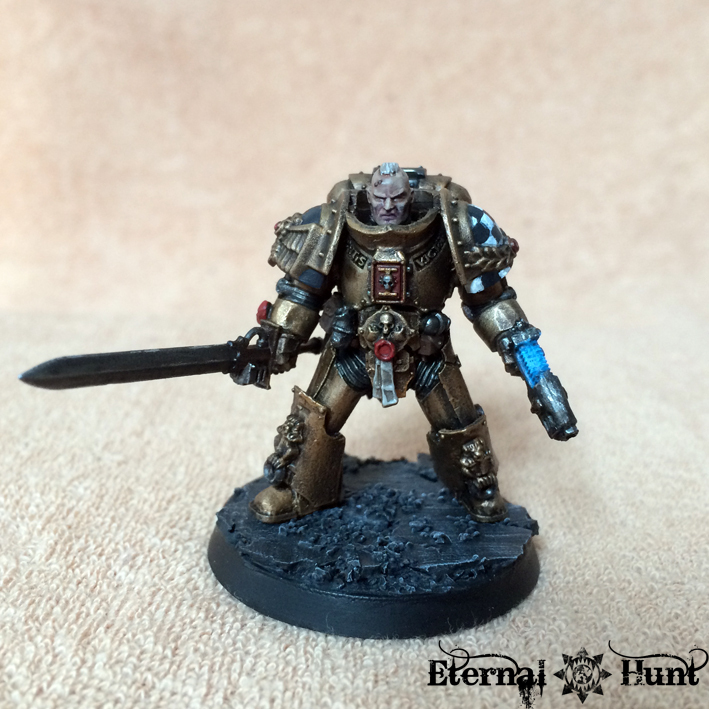 I’m a firm fan of Inq28 miniatures and Janus Auriga is a wonderful addition to the genre, great work. 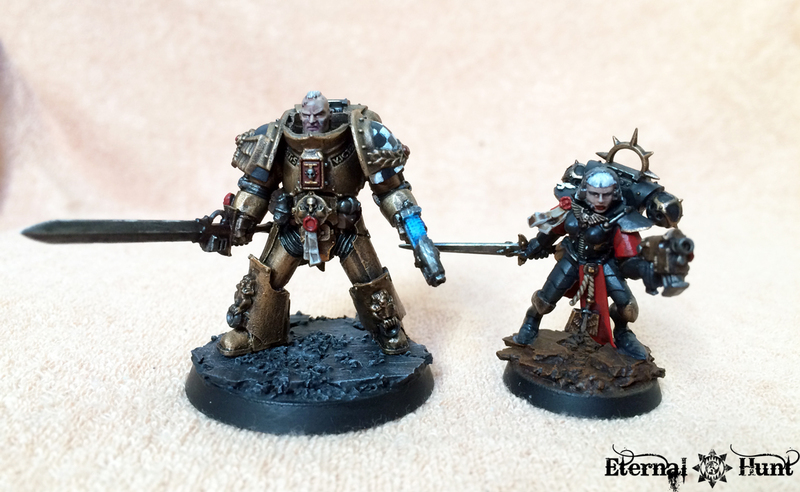 I’ve never been sure if Inq28 was purely a modelling project or do people play Inquisitor? The size of the warbands involved has always seemed very evocative and and the game seems much more immersive than the direction 40k has gone in and I’ve often wondered if there is a gaming scene for this? 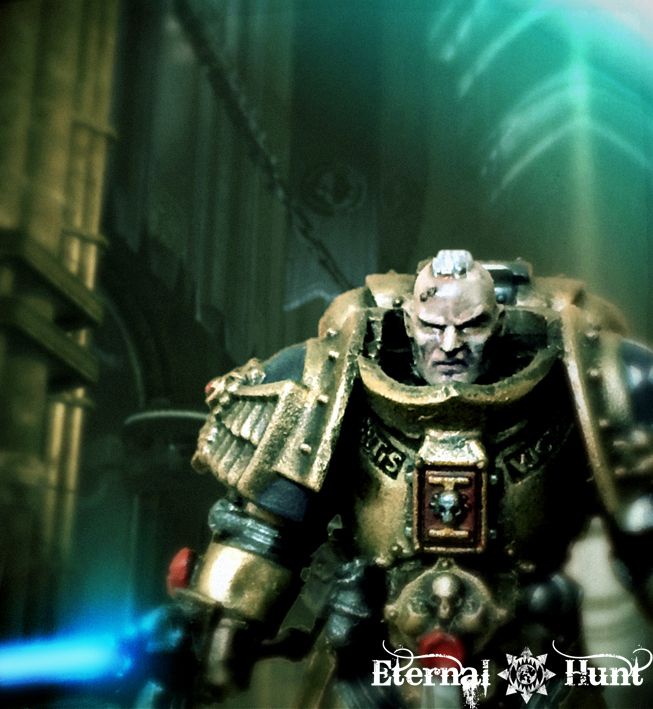 I loved the story (as usual 😉 ), it really set my imagination off….is there a war coming?….has corruption and heresy touched Bastold?…..truly brilliant stuff! 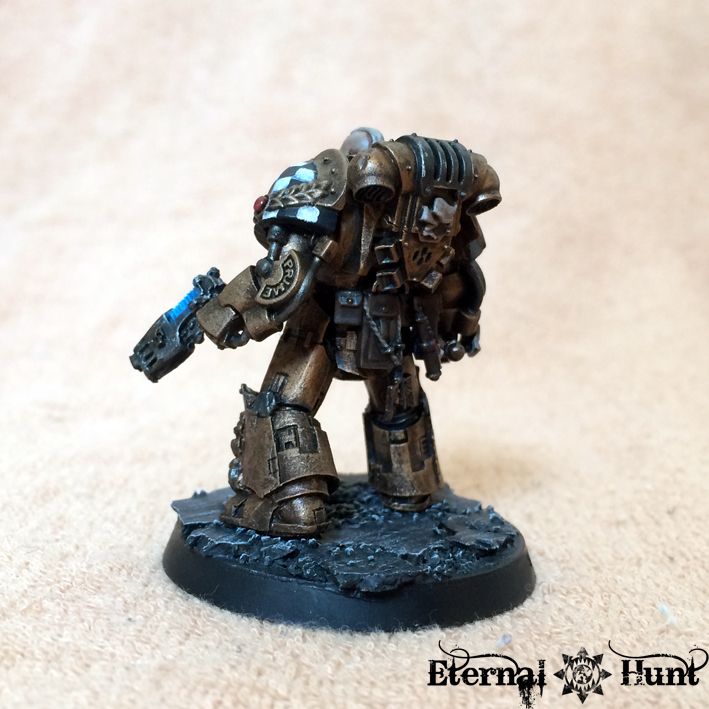 Really like how backpacks look on a truescale marine, it becomes a detail of the armor rather than taking a quarter of the marine’s body on regular models. 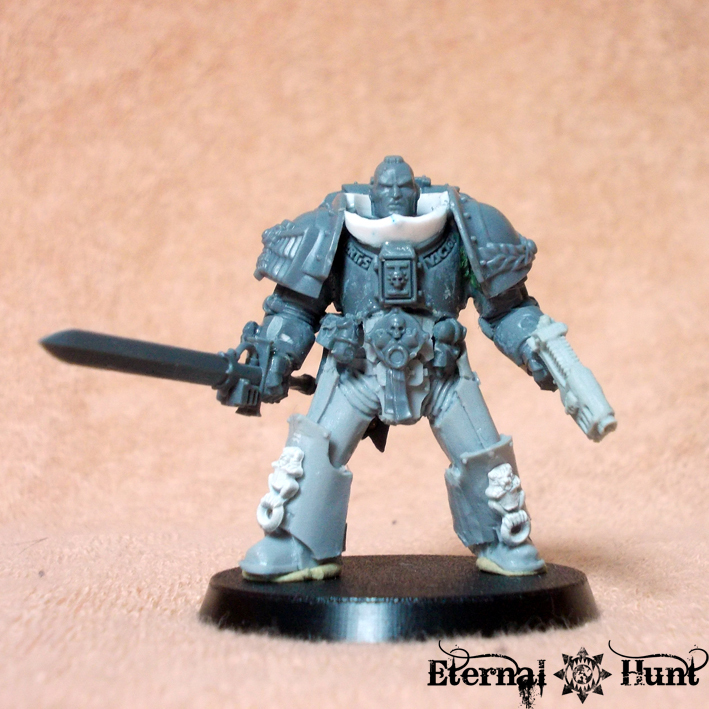 Plus i was sceptic about this head in the vanguard set but you made it brightly cool !